111 S. 3rd Ave. E.
The McGrath House was built in 2001 as a home with two baths and a large private yard. Sleeps up to 9 and is furnished from kitchen to bath. 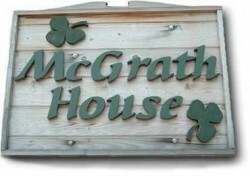 The McGrath House is the complete package for a couples’ getaway or a large family gathering. Enjoy the fire pit, grill and yard games. We’re two blocks from the lake and centrally located for year-round relaxation and recreations. Enjoy your home away from home.